I recently headed to Bordeaux Quay for an evening of olive based love and to learn a little bit more about the world of olives. Teaching us the ropes was talented Spanish Chef and olive expert, Omar Allibhoy, described by Gordon Ramsey as 'the Antonio Banderas of cooking'. We quickly got stuck into making an olive based desert. WTF you say? Dessert first!... Oh right, a dessert made with olives is weird - that too. But it turns out caramelising black olives and fresh cherries in a sugar syrup and melting some goats cheese into a mouthwatering custard makes a damn fine desert. After a quick taste and another glass of wine we sat down with a massive bowl of fresh olives in front of us to discuss these black and green ovals of joy. It turns out olives are pretty blooming good for you! A super-food some might say. Like a superhero that hangs out in bars in tiny bowls. Not only do they have a high iron and Vitamin E content (like a superhero? ), but they also have a big ol’ dose of unsaturated fats. Nope, not the kind of fat that sits on your hips FOREVER, but the kind that your body actually needs and craves. Olives were looking more appetising as a cooking ingredient by the minute.... so we all helped ourselves to a few more. Unsurprisingly, there were more olives on the menu that evening. 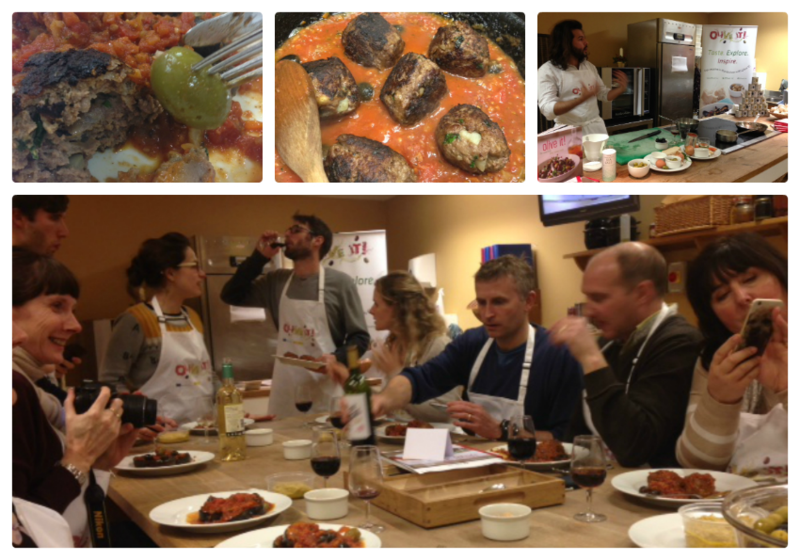 Again, with Omar and his distinctively Spanish flare by our side, we set out making some olive meatballs. A beautifully simple recipe. Apparently not simple enough… as two of the group (I'll let you guess which ones) completely missed the concept of a meatball and literally wrapped olives with straight up beef mince. Which is wrong... Thankfully, the gracious Omar laughed along with our funny 'joke' and carefully explained the correct way to make a meatball with seasoning, bread, milk and egg. Who knew? Throughout our evening, we learnt even more about our little friends; that green and black olives aren't different varieties, but the same olive left on the tree to ripen for a longer time. We even found out that olive trees can live for 1500 years and every table olive is handpicked from the tree (which we can only assume explains their sometimes hefty price tag). Once our mind had been suitably expanded we headed home, promising ourselves to use olives in our own cooking much more frequently, for the health benefits of course... not at all because of their to general tastiness. Omar was even kind enough to provide us with cookbooks written by himself and renowned healthy-eating guru Sophie Michell, to learn more about these Mediterranean gems and to cook up some treats ourselves. Remember, olives aren't just tasty snacks, they are a versatile ingredient that you demand your total respect, and your best Spanish accent. For all the latest news and ideas on how to incorporate Mediterranean olives into your diet follow @Oliveit_UK on Twitter or head over to the Facebook page. Omar will also be sharing his tips and tricks on how to make the most out of Mediterranean olives on the Olive It website. You'll be an olive expert before you know it!